My Halloween quilt is done! 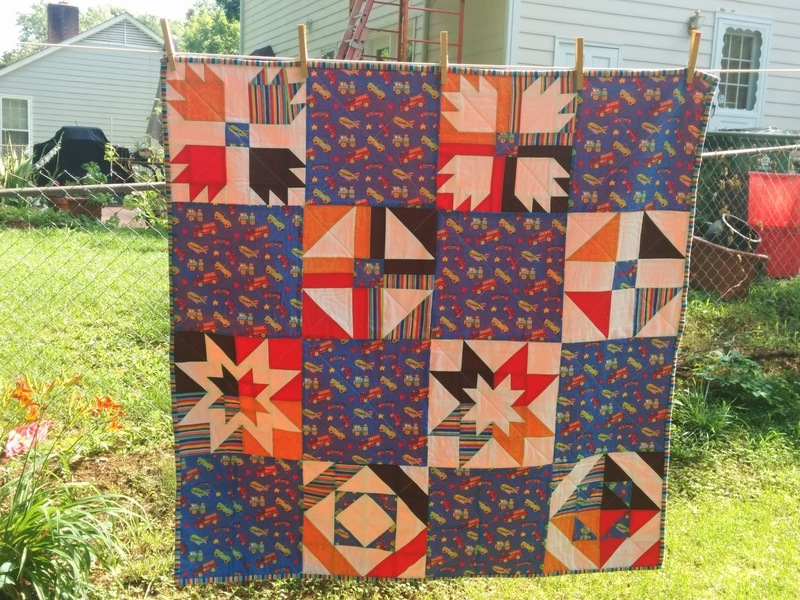 I was able to get it quilted and the binding attached before our trip to Atlanta last weekend so that I could finish the binding in the car. I love sewing binding on car trips. 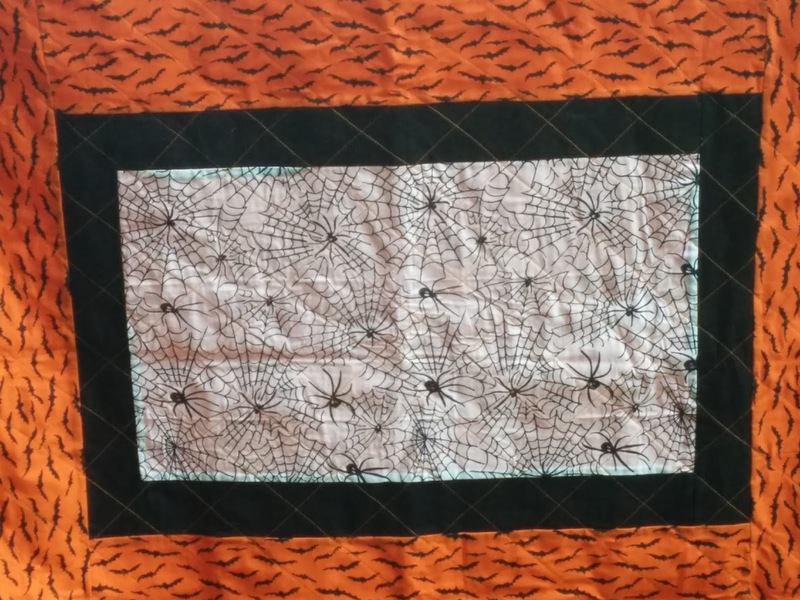 The spider print in the middle came from a "fill a scrap bag" table at a local guild's quilt show I attended in March. 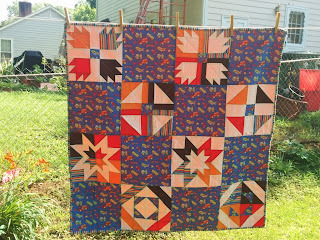 I was mostly looking for scraps to add to my Scrap Dance Tango quilt, but of course I could not pass up any I Spy/novelty fabrics that I came across. The bats were a sale fabric I found shortly after that, and I thought the two would pair well together. I quilted in diagonal grip using my "guide thingy" as wide as it would go. I like this method, as it means I only have to mark a center line going each direction. (See this post for details on the first time I used this contraption.) 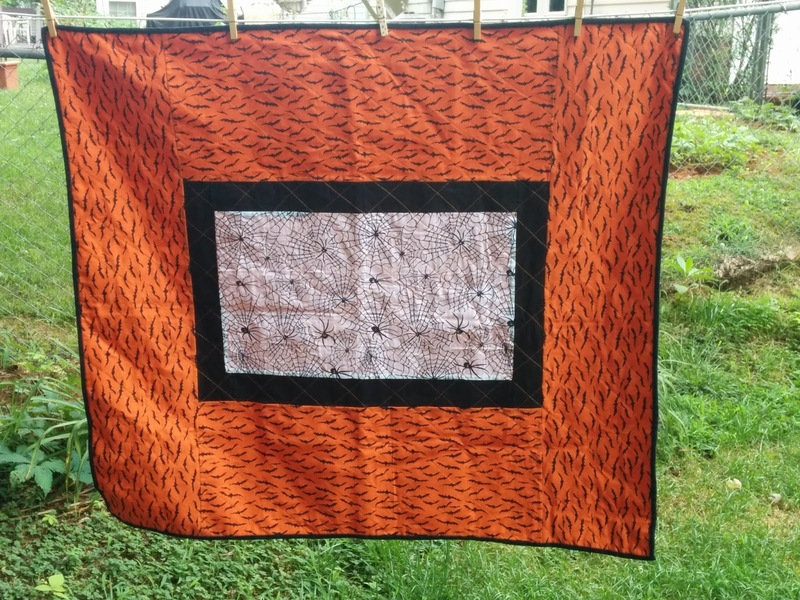 I used orange thread, and though I wasn't sure that was a good choice, I'm really happy with it now. 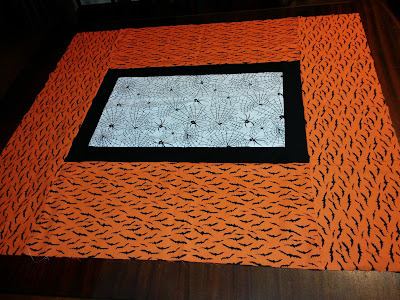 Ironically, I chose it partly to use up a spool of orange thread because I rarely use orange, but I ran out and had to buy more orange thread :) Best laid plans, right?! My Stashbee Queen Marie asked for Bear's Paws in plaids. I have always loved Bear's Paws but had never made one, so I was excited. I struggled with this block! I'm not sure why. I got the "paw" part sewed backwards many, many times and did a whole lot of ripping and re-sewing. At one point, I was frustrated and muttering to myself and Husband heard, so he came in to where I was sewing. He looked at the tutorial up on my screen and said, "That doesn't look too complicated." Thanks, babe. He gets a lot of amusement out of my lack of spacial skills! 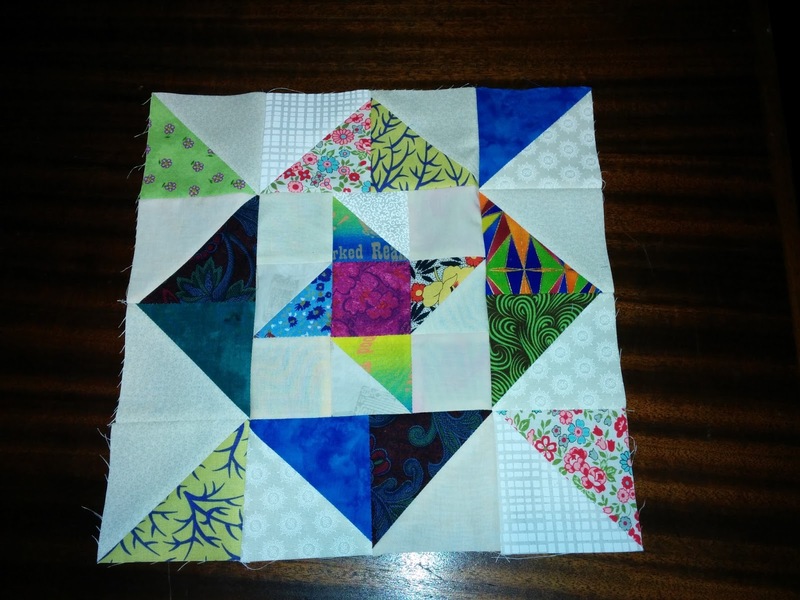 But I did end up with a finished block, plus one extra paw. I had a second extra paw, but it was so off that I destroyed it! 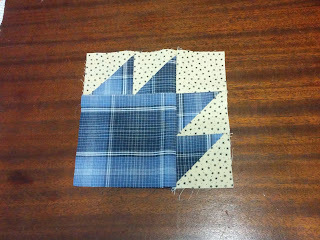 I cut off the claws and saved the center square to use in the Scrap Dance Tango. In addition to the blocks, she had some of the blue vehicle print and some of the stripes. I was able to get just enough out of the vehicle print to alternate blocks. Two of the vehicle blocks are pieced, but I don't think that it's super obvious. I was almost done with the binding when I last saw Snow, so she's seen the (almost) finished product and is pleased. 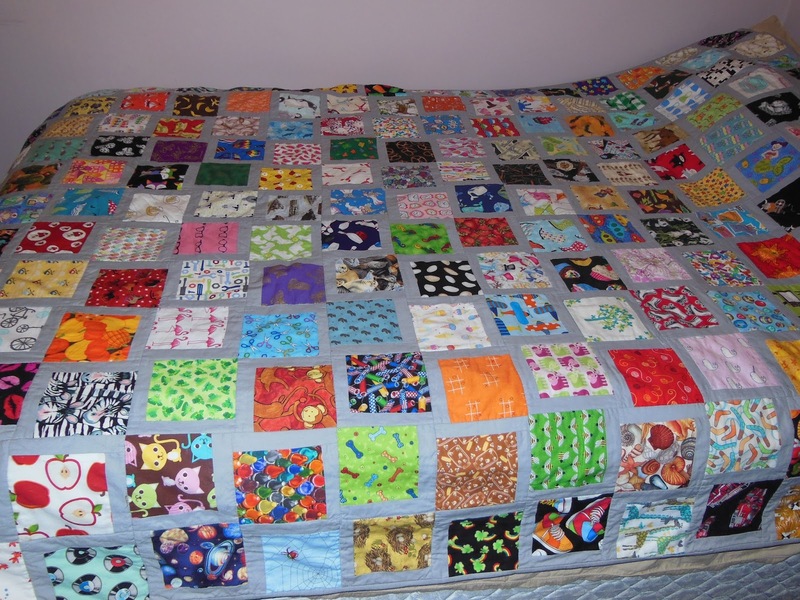 This will be going to Project Linus at the July meeting. This was on my list of Quarter 2 goals for the globally hosted Finish Along. 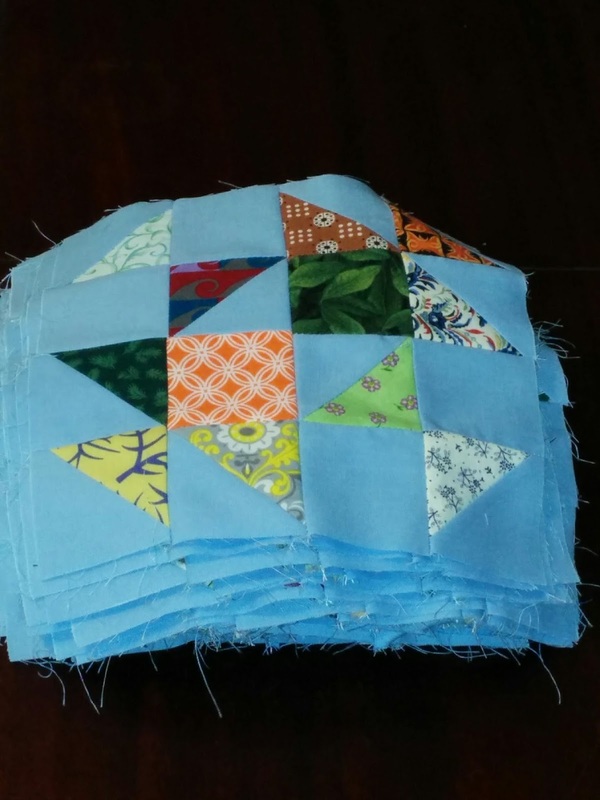 Last fall, Faith from Fresh Lemons was hosting a quilt along for her Snowflake quilt. 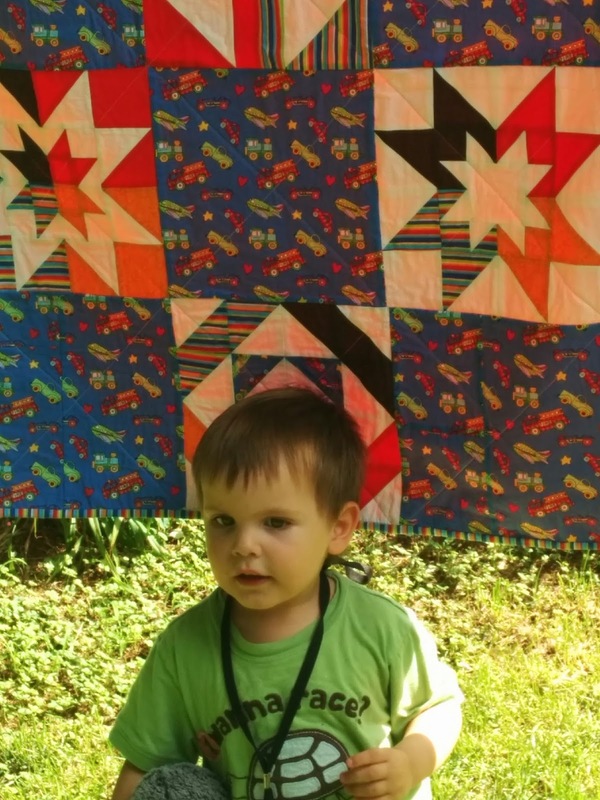 It was offered through Bernina's We All Sew blog, and was done in three parts over the course of three weeks. I knew I couldn't even start it in that time frame, let alone finish it! But I liked that the pieces were 2 1/2 inches wide; I had just finished my I Spy strip swap, so I had all these great I Spy strips. I had been wanting to do a pink and gray quilt, so I picked out all the pink and gray I Spy strips and I set them up with some Kona Snow as my leader and ender project. 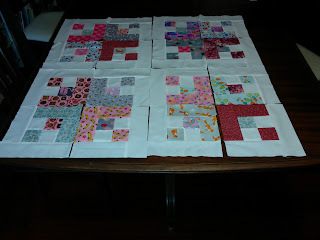 I just finished piecing all the blocks last week. 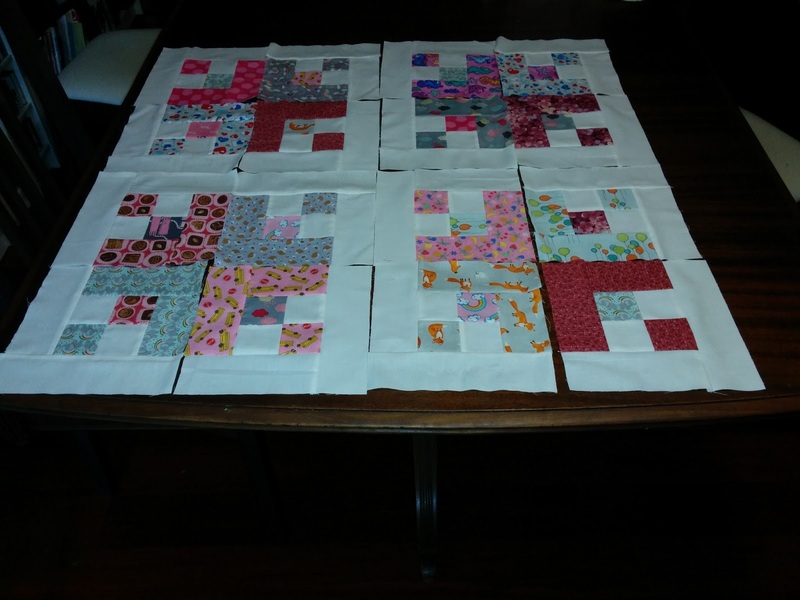 I have 20 predominantly pink blocks and 14 predominately gray blocks. I'm not sure I like the original layout, so I've been playing around with some other options. I don't have a design wall, so these are laid out on my dining room table. I'm still deciding. 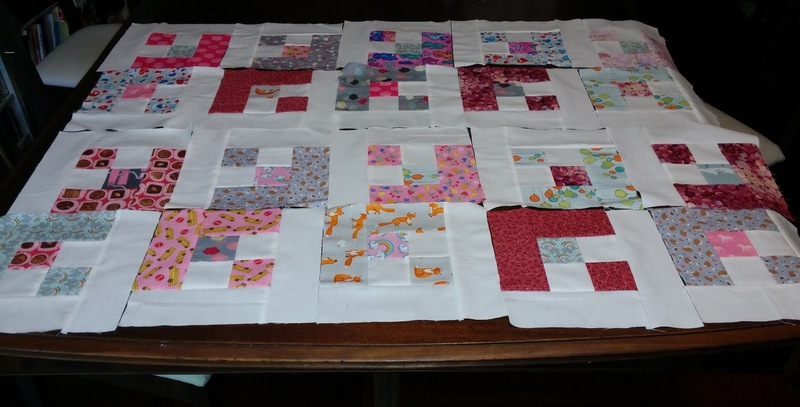 Most of my layouts require equal numbers of pink and gray blocks, so I might need to make a few more gray blocks. 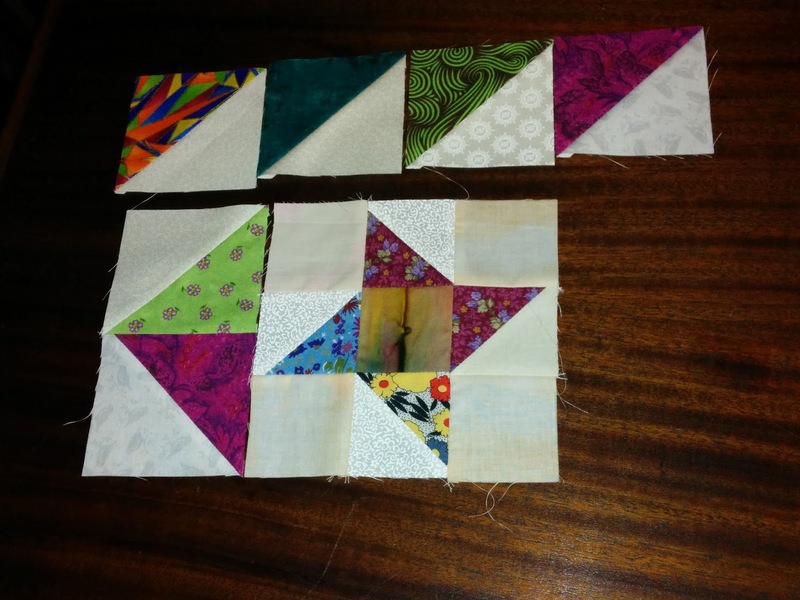 For the moment, I've put these blocks away while I think on it. 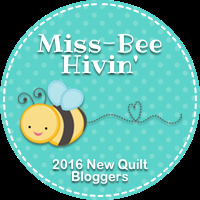 I am pleased to be a part of the 2016 New Quilt Bloggers group. To participate, you had to have been blogging less than 2 years. 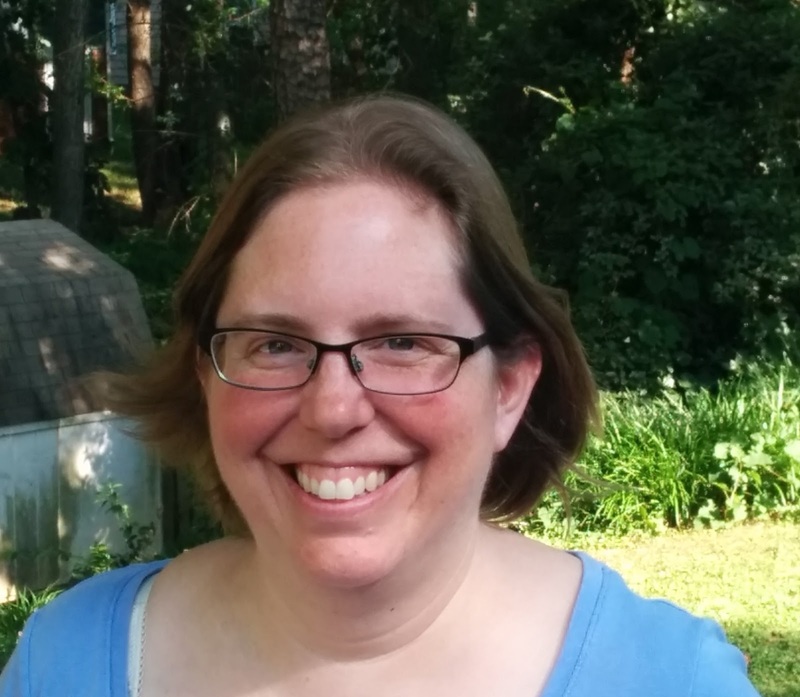 I became active in January 2015, so that seemed perfect to me! The first part was getting to know each other and critiques in small groups, and I have made some changes based on that valuable feedback. There are still things I want to change, but with so little free time, it's hard to spend it fiddling on the computer instead of sewing! 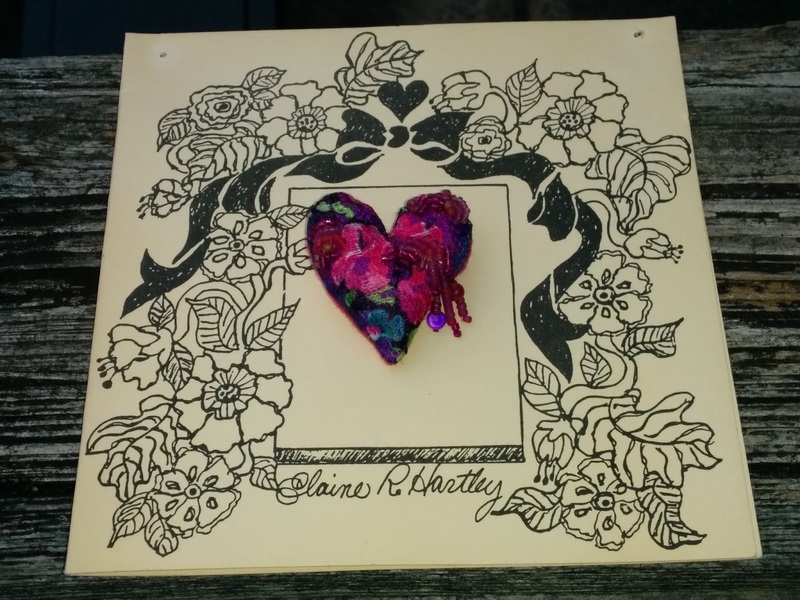 There are about 55 of us in this year's group, and we are led by Yvonne from Quilting Jet Girl, Cheryl from Meadow Mist Designs and Stephanie from Late Night Quilter. We've been divided into smaller groups; mine is led by Cheryl and we have the name Miss-Bee-Hivin'. 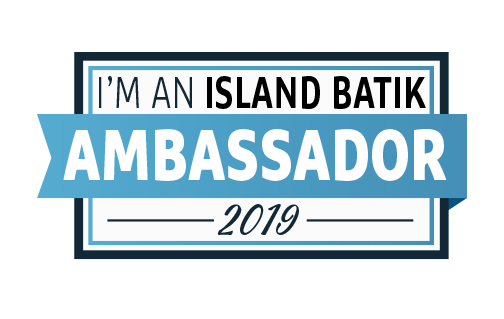 Member Amista designed our button. 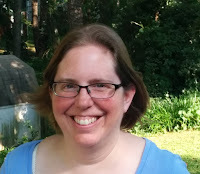 Posts for the blog hop portion start this Monday and run for several weeks. More information will be here as it is available. May was a productive month for me. I had a few finish and significantly advanced several other projects. June will be a different story. My dad is here for a week, and my guest room and sewing space are one and the same, so that significantly impacts my sewing time. My machine is scheduled for service, so that's another week of no sewing. And we have 2 different trips planned for the month, one day trip and one long weekend. 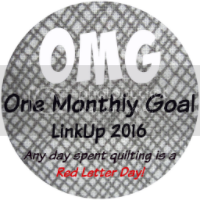 So when it came time to set a June goal for Heidi's fantastic One Monthly Goal motivating linky, I knew I needed something realistic. Last Friday, I played around and came up with this very simple top. 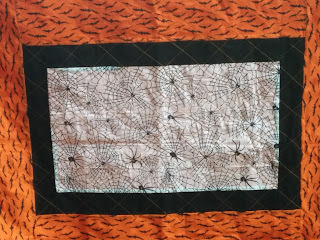 The spider print in the middle came from a "fill a scrap bag" table at a local guild's quilt show I attended in March. I was mostly looking for scraps to add to my Scrap Dance Tango quilt, but of course I could not pass up any I Spy fabrics that I came across. The bats were a sale fabric I found shortly after that, and I thought the two would pair well together. I like to bind by hand when we travel in the car, so if I can get this quilted and the binding sewn on the first side, I should be home free. My goal is to have a completed quilt for Porject Linus by the end of June. 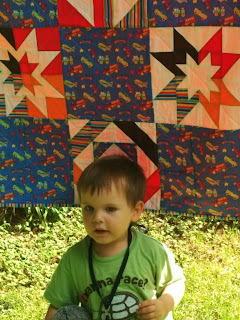 I've been doing the Scrap Dance Tango mystery quilt hosted by Carole at From My Carolina Home. The mystery started in January, and I believe the next-to-last step will be posted this Friday. Almost from the beginning, I've been woefully behind. Step 1 included cutting fabrics and making half-square triangles. For my chosen size, I need 1,100. I am still not completely done with Step 1. But I did finally complete Step 4. 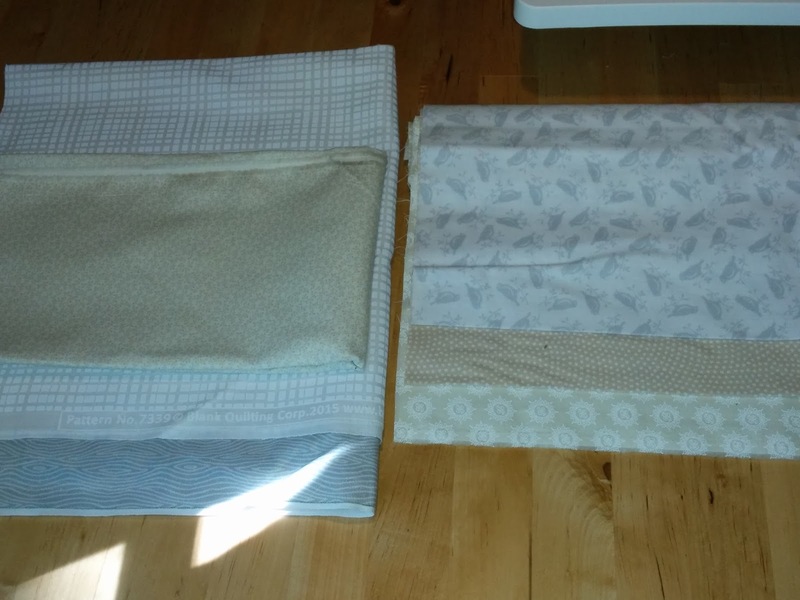 These are Unit A, and will make up half the quilt. This will not be the final layout. It's still a mystery! 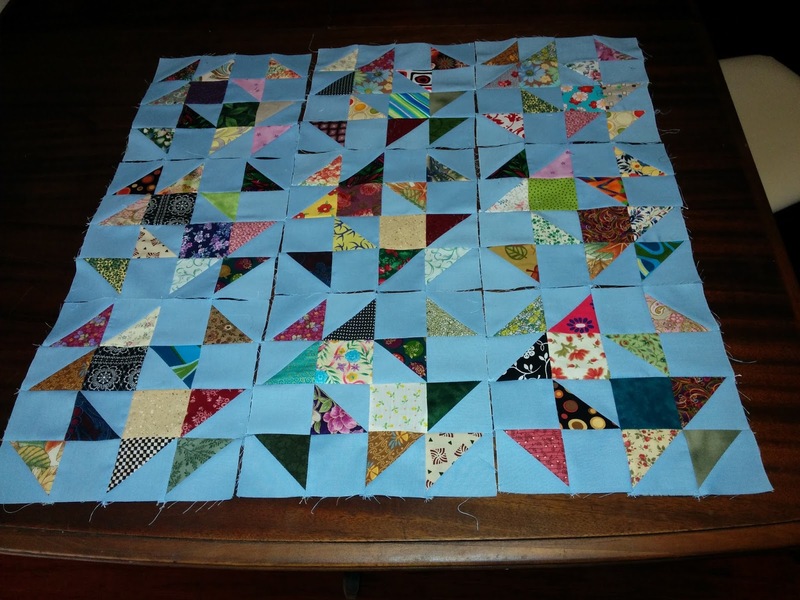 This quilt will be a Christmas gift for my dad, assuming I complete it in time. He's visiting right now, so the pieces are hidden away. Which means I will get even farther behind, but I at least feel like I am making progress! 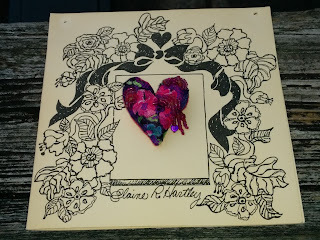 I will be linking up with Scraptastic Tuesday once the linky is open. I'm having trouble with the button today, but you can find it here. 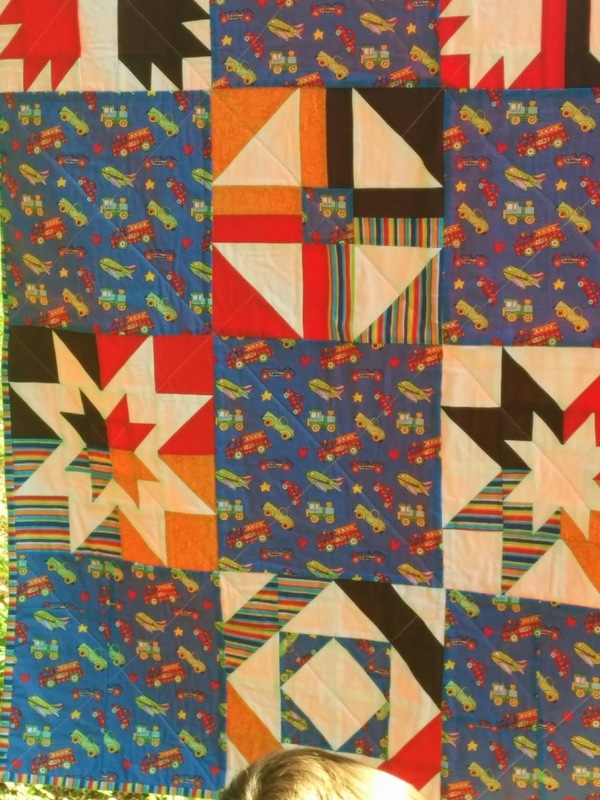 I like how the block looks, and I think that when combined, multiple scrappy blocks will look great. It wasn't my favorite to piece, mostly because I don't usually choose blocks with tons of pieces in them. But that's exactly why I joined the Stash Bee, to do blocks in styles that I wouldn't otherwise choose. 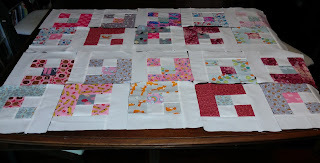 I didn't make a complete 2nd block, but I did make several components of another block and sent those along as well. These will travel all the way to Wales, which is pretty cool! Another awesome thing about the stash bee! 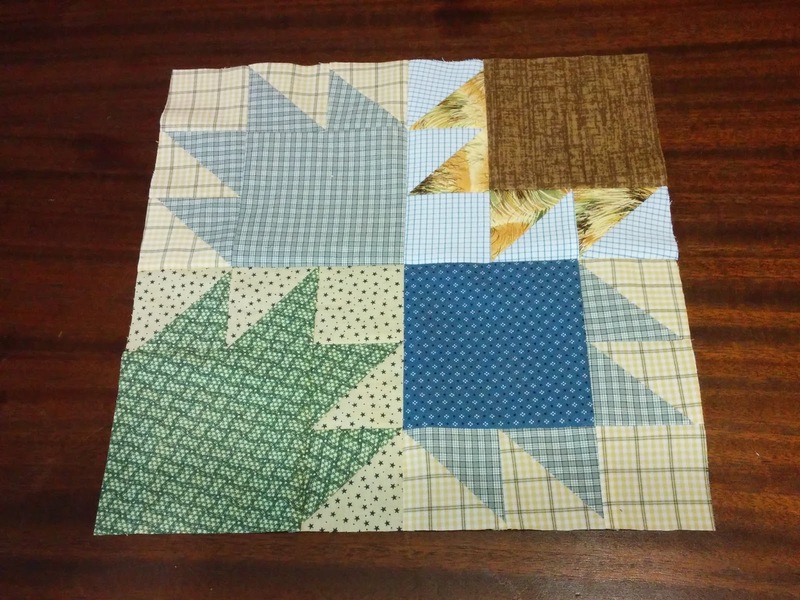 I realized as I was working on this block that my low volume stash was pretty, well, low. 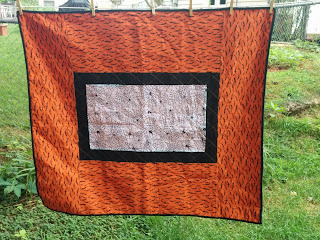 Since a lot of the stash bee blocks are scrappy and many seem to call for low volume, I decided this called for a trip to the local quilt shop! I picked 6 different low volumes and bought a half yard of each. It also turns out that this quilt shop has a box of toys to occupy little ones--Munchkin found a great truck and had a glorious time while I ran around trying to select, get cut, and pay in the 15 minutes I promised Husband.